Ryan Giggs admitted that his Wales side needed to win their opening qualifier for Euro 2020 after they beat Slovakia 1-0 at the Cardiff City Stadium. Dan James' early strike proved enough on a nervy day in the Welsh capital. Both Slovakia and group favourites Croatia won their opening qualifiers, adding to the pressure for Wales. "You play it down before the game, but when Croatia and Slovakia have got off to a winning start, it makes it nice for us to do the same," Giggs said. Wales face successive away games in June in Croatia (8 June) and Hungary (11 June) and could ill-afford a slow start in qualifying. "It is job done and we are delighted to get a winning start, especially with the pressure on," Giggs told BBC Sport Wales. "At the end we had to work for it, but overall I am delighted with the result. "You try and not make too much of it, but we didn't want to go into the two away games in June with no points or one point." James agreed that the players knew what was at stake. "I think with the other teams getting points on the board in the first game it was very important for us to get off to a good start," he said. "It is a massive result, we've got two tough games in four days in the summer, so we will need to prepare right." 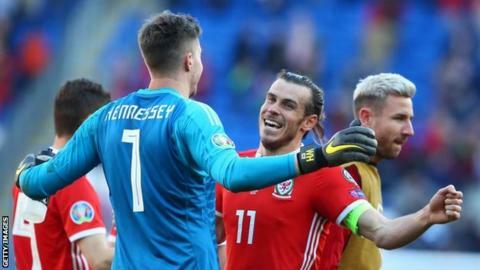 James said his first goal for Wales was a dream moment, as he continued his recent fine form for club side Swansea City. "I think the ball just popped up for me and as soon as I hit it I knew it was in. It was a long game after that, we needed to dig in and we did," he said. "They put us under pressure but I think we showed as we have sometimes that we can grind results out. "It was amazing for me, a proud moment for me and my family and to get the goal makes it even better." Giggs believes James will have left an impression on the Slovakian defenders. "Dan has taken his club football into international football, because he's been on fire," the manager added. "I was delighted he scored the goal, he was a constant threat and in the first half, we will have given the defenders nightmares because of his speed and his directness." Giggs says he enjoyed the atmosphere at the Cardiff City Stadium and hopes the Wales fans enjoyed the performance of his side. "Hopefully the fans went home happy after seeing a really good game," he said. "In the last Euro qualifying campaign, the Cardiff City Stadium was a fortress and we want to recreate that again. "We want our fans to get behind us because they are a part of the journey; they can help us get there." Talisman Gareth Bale says the result was a reward for an impressive team display. "Everyone put in a shift today. It's what we are used to. The minimum requirement is to put in 110% and everyone did that," he said.